This week’s featured wine is a Rosé from the Languedoc region of France, 30 miles north of Spain. The village in Rousillon where the grapes were grown used to be part of Spain in the 17th Century, and Penya is its traditional Catalan name. There are still so many misconceptions about Rosé, so let’s clear up a few of them. Misconception #1: All Rosés are sweet. Nope! Just because most Rosé is pink does NOT mean it’s a sweet White Zin from the 80s. That trend gave pink wine a bum rap. The finest Rosés are bone dry, despite their salmon hue. Misconception #2: You only drink Rosé in the summer. Yes, there are traditional summer Rosés that are lighter and more refreshing than others, but there are also many more robust Rosés that will knock your socks off. Misconception #3: Rosé is just red and white wine mixed together. Nope! Quality Rosé is made from red grapes. The juice from the grapes, which is white, is allowed to ferment in contact with the grape skins, which contains all the red pigments, for a few hours or a few days, until the juice becomes a delightful pink color. At this point, the juice is pressed off the grape skins, and then fermented into wine. The other misconception is actually a benefit to those of us who appreciate a quality Rosé: it’s very inexpensive. True, you can find some of the best Rosés in the world for $40 or more, but most are around $10, which means you can enjoy a finely-crafted wine for little cost. Better yet, bring a Rosé to a party and your friends who prefer red wine will like it as much as your friends who prefer white wine! It’s a win-win situation! Open a bottle of Penya Rosé and the first thing you’ll notice is the aroma. It’s very floral, almost a violet scent mixed with cranberry and juniper. The flavor is completely different, raspberry and melon, not sweet at all, but bright and refreshing, with a finish of dried cherry. 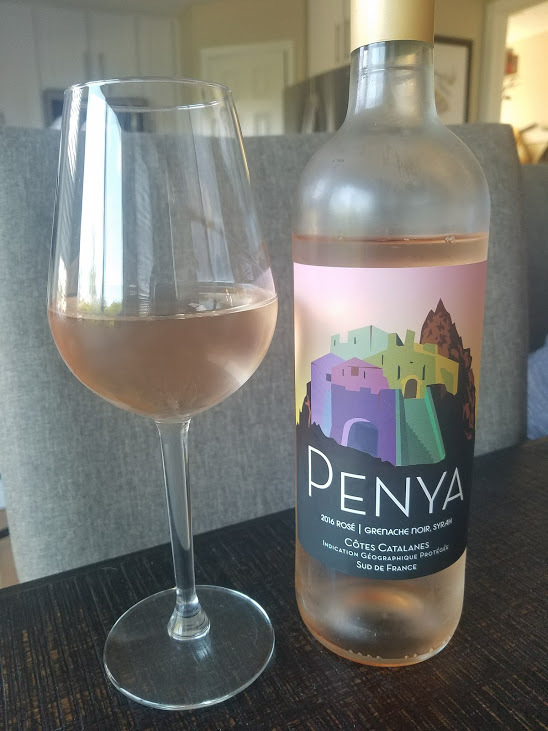 On my five-cork scale based on taste and value, I give the 2016 Penya Rosé 3.75 corks! This is an excellent wine, almost 100% Grenache, and a bargain at $12.99.